Download "Address : Seti Sharm Palm Beach Resort Sharm El Maya Bay, Sharm El Sheikh, South Sinai, Egypt Tel : Fax : :"
2 Address : PO BOX 27, GAZI- HERAKLION - CRETE - GREECE Tel : / Fax : web : Official Category : 4 star Concept : All inclusive Renovation Date : partially renovated in 2013 Area : m2 Valid credit cards : VISA, MasterCard Languages : Greek, English, German, Russian C/out & C/in time : C/out time 12:00, C/in time : 14:00 Pets : Not allowed Location Located on the beach of Amoudara, just few minutes away from downtown Heraklion, the hotel Dolphin Bay is ideally located offering you easy reach to the centre of Heraklion while enjoying the marvellous, endless sandy beach of Amoudara, surrounded by beautiful gardens and relaxing walking space. 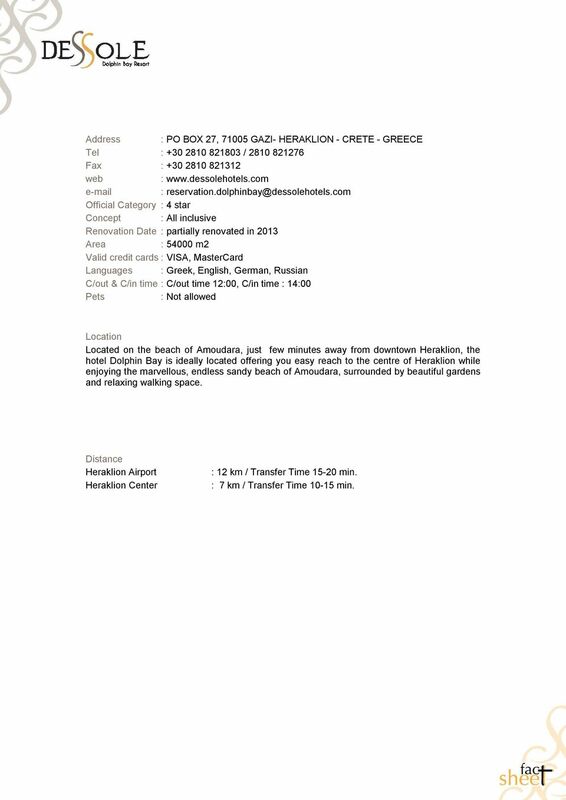 Distance Heraklion Airport Heraklion Center : 12 km / Transfer Time min. : 7 km / Transfer Time min. 4 Concept Free Of Charge Services Food, local & standard alcoholic drinks, refreshments, local draught beer, local house wine, mini fridge (refilled daily with mineral water), safe deposit box (in the room), daily sport facilities & night shows, table tennis, tennis equipments, basketball court, beach volley, gym, mini club, beach towels changed in the room every 2nd day, umbrella and sunbeds by the pool and on the beach, wireless internet connection in the public areas of the hotel, TV room. Paid Services Beverages in cans or in bottles, all kinds of imported beverages, fresh fruit juices, medical services, baby sitter, wellness center services, hair dresser, manicure, sauna, massage, electronic games, billiard, telephone, fax, water sports (200 m from the hotel), shops, laundry. Lost and damage of guest room key, lost safe box key,lost AI bracelet. Pools Min-Max Main pool fresh water 275 cm 280 m² Children pool (attached to main pool) fresh water 60 cm 20 m² Water slide pool fresh water 245 cm 180 m² *Pools closed at sunset. Beach Sandy Beach Length of the beach : 130 m Sunbeds, umbrella. 5 Food and Beverages Main restaurant offering, breakfast, lunch, dinner, beach taverna offering snacks and thematic biffet nights and 4 bars. Food Services Hours Services Restaurants 07:00-10:00 Breakfast (open buffet) Main Restaurant 10:00-11:00 Late Breakfast Main Restaurant 11:00-16:00 Snack service Beach Taverna 13:00-15:00 Lunch (open buffet) Main Restaurant 15:00-17:00 Ice Cream Time Beach Taverna & Pool Bar 16:00-17:00 Tea Time Beach Taverna 19:00-21:30 Dinner (open buffet) Main Restaurant 19:00-21:30 Thematic Nights Beach Taverna (by reservation, once per stay) During lunch and dinner: water, soft drinks,local draught beer and local house wine. 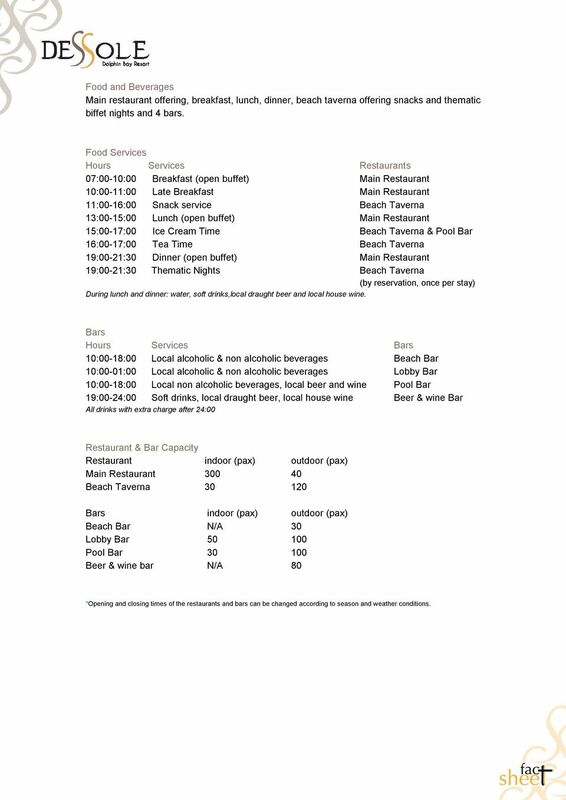 Bars Hours Services Bars 10:00-18:00 Local alcoholic & non alcoholic beverages Beach Bar 10:00-01:00 Local alcoholic & non alcoholic beverages Lobby Bar 10:00-18:00 Local non alcoholic beverages, local beer and wine Pool Bar 19:00-24:00 Soft drinks, local draught beer, local house wine Beer & wine Bar All drinks with extra charge after 24:00 Restaurant & Bar Capacity Restaurant indoor (pax) outdoor (pax) Main Restaurant Beach Taverna Bars indoor (pax) outdoor (pax) Beach Bar N/A 30 Lobby Bar Pool Bar Beer & wine bar N/A 80 *Opening and closing times of the restaurants and bars can be changed according to season and weather conditions. 6 Entertainment & Activities Day Activities : Morning gymnastic, step aerobic, water gymnastic, stretching, beach volley, beach football, beach dance, beach game, club dance, noon & cocktail game, dart game, dance lessons, tournament, table tennis, boccia, backgammon, cards Night Activities : Night show programs, competition, comedy shows, folklor music, live music, karaoke nights, mini disco & children shows Mini Club : Children playground indoor and outdoor. 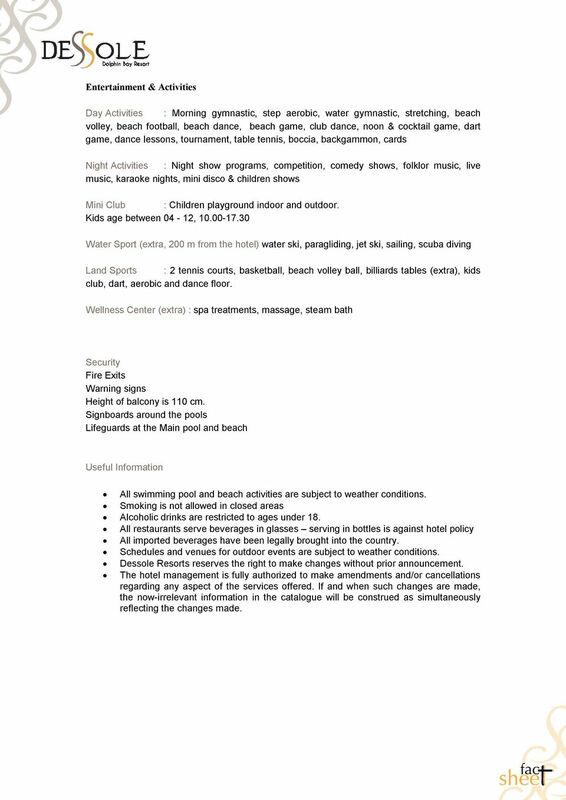 Kids age between 04-12, Water Sport (extra, 200 m from the hotel) water ski, paragliding, jet ski, sailing, scuba diving Land Sports : 2 tennis courts, basketball, beach volley ball, billiards tables (extra), kids club, dart, aerobic and dance floor. 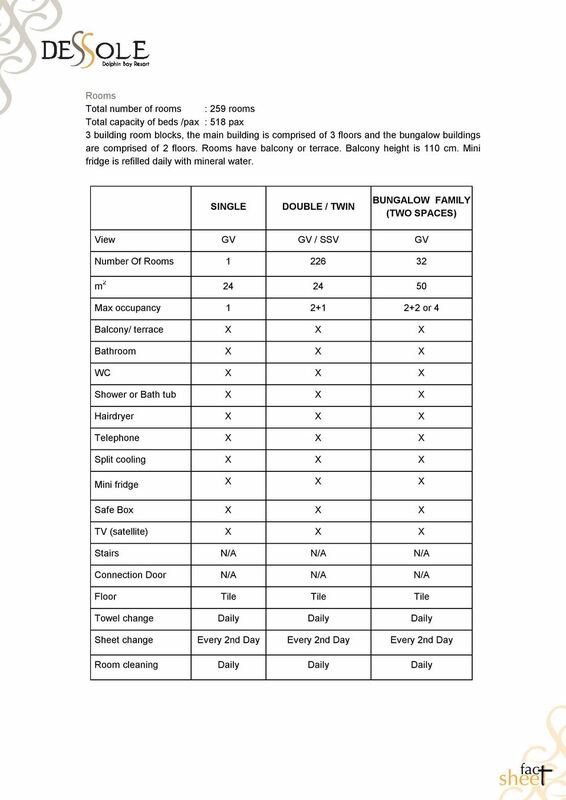 Wellness Center (extra) : spa treatments, massage, steam bath Security Fire Exits Warning signs Height of balcony is 110 cm. 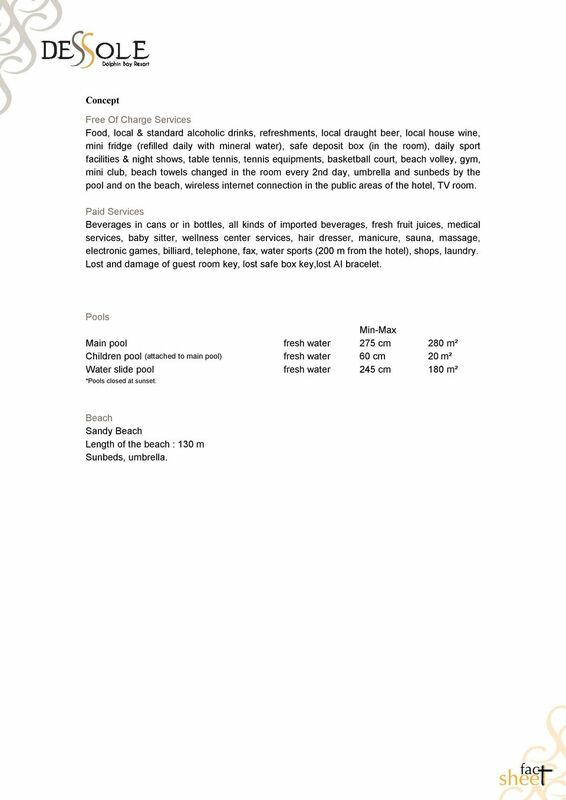 Signboards around the pools Lifeguards at the Main pool and beach Useful Information All swimming pool and beach activities are subject to weather conditions. Smoking is not allowed in closed areas Alcoholic drinks are restricted to ages under 18. All restaurants serve beverages in glasses serving in bottles is against hotel policy All imported beverages have been legally brought into the country. Schedules and venues for outdoor events are subject to weather conditions. 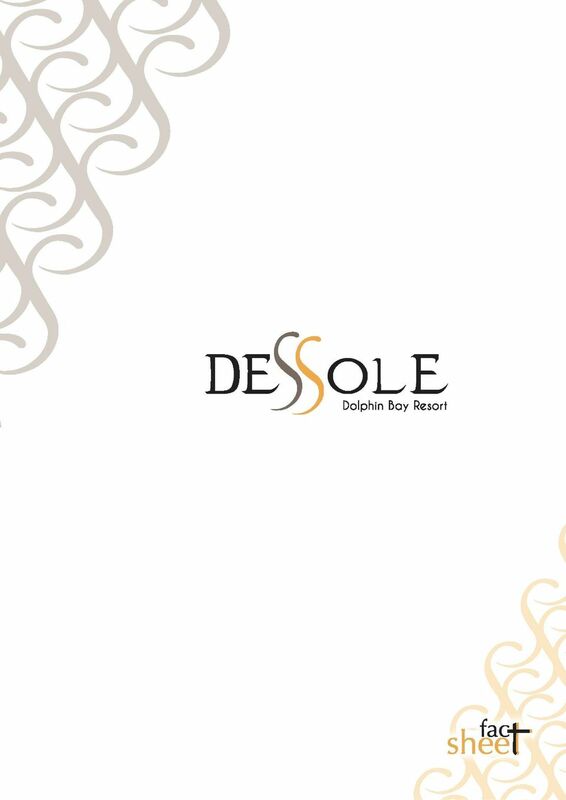 Dessole Resorts reserves the right to make changes without prior announcement. The hotel management is fully authorized to make amendments and/or cancellations regarding any aspect of the services offered. If and when such changes are made, the now-irrelevant information in the catalogue will be construed as simultaneously reflecting the changes made. Distance. Tunisia Carthage Airport : 65 km / Transfer Time 45 min. The Grand Plaza Resort Hurghada Red Sea - Egypt All Inclusive System Grand Plaza Style The Grand Plaza Resort Hurghada, a 4 stars Resort with 199 rooms, is designed to provide a most memorable vacation. MarBella Corfu Hotel is situated on the south-east coastline of the Greek Island of Corfu at Agios Ioannis Peristeron, set in lush landscaped gardens. Barceló Pueblo Park Palma beach Q Tourism Quality Certificated. Location The Barceló Pueblo Park, with a privileged location in the heart of Palma beach on the Balearic Islands of Majorca is a highly recommendable hotel for families, built in traditional Majorcan style. Divani Corfu Palace 20, Nafsikas Str. 49100 Corfu Island Greece Tel: +30 26610 38996 Fax: +3026610 35929 E-mail: info@divanicorfu.gr, www.divanis. 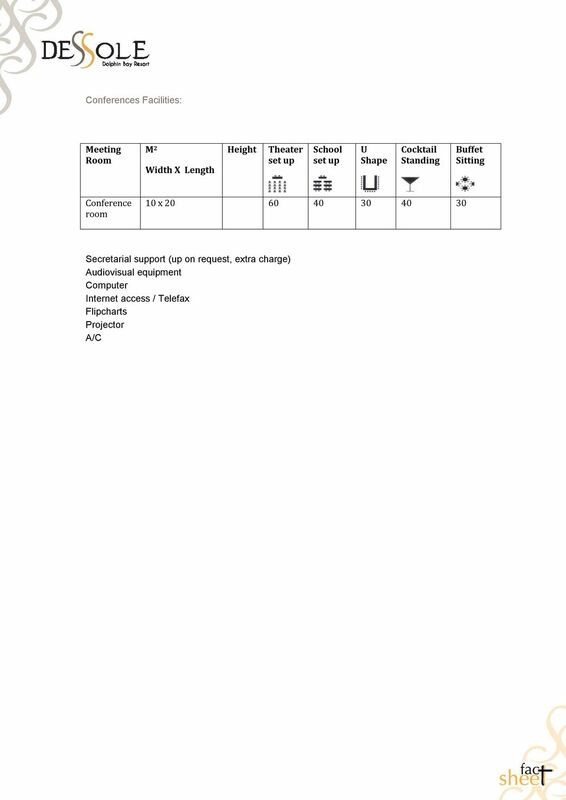 2015 FACTSHEET 01 April 2015 07 November2015 Opening date: 2002 LOCATION Antalya Airport 8 Km Last renovation: 2014 Categori: 5 * Total ground: 112.000 m 2 Post address: Guzeloba Mah. Yasar Sobutay Bulv.